Italian cuisine is world famous. 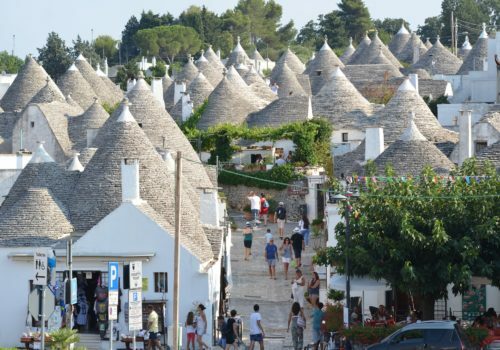 This luxury tour will give you the chance to indulge your senses in Salento – picture the boot shape of Italy, it’s on the heel. We’ll see the key sites in the local area and enjoy the finest food and wine. You’ll learn to cook in the local style with the help of the best chefs. You’ll also learn about the wines and olive oils unique to this region, and find out how to refine your pallet. Some of the places we’ll visit include Lecce, Otranto, Gallipoli, Nardo and Santa Maria di Leuca. This will be an indulgent trip: we’ll eat and drink a lot. 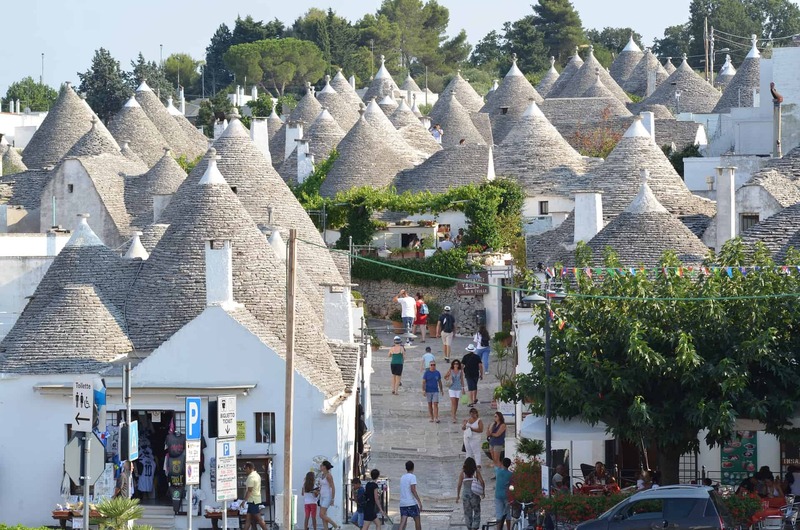 You’ll also get plenty of time to relax, shop, enjoy the sun and take a boat ride around Puglia. There are also weekly departure dates throughout July and August. Enquire for more details. We can collect you from Brindisi airport or Lecce train station. We’ll take you to our exclusive private villa where our food and wine odyssey begins. You can unpack and prepare yourself for our first delicious meal – so don’t eat too much before you arrive. In the morning we’ll have breakfast and then our first cooking class begins. A local chef will show us how to make a series of classic Salento dishes. We’ll be using seasonal, locally sourced ingredients. You’ll discover some great cooking tips that’ll impress your friends when you get back home. We’ll eat all the food we make so you won’t go hungry. We’ll then head to the town of Porto Cesareo. It’s beautiful beaches and clear waters are something to see. You can go for a swim, do some shopping and then it’ll be time to eat again. We’ll enjoy fish, seafood and wine; perhaps an aperitif as well. After breakfast we’ll head to Santa Maria di Leuca, the Southern-most point of Puglia. We’ll see stunning landscapes on the way. After exploring the city we’ll head to the port and get on a private boat. Drinks and lunch will be served on board, and then we can swim and soak up the sun. We’ll enjoy dinner back at the villa prepared by your host. After breakfast we’ll head to the farmers’ market and stock up on ingredients. We’ll be returning to the kitchen to cook these ingredients ourselves. We’ll even learn how to make fresh pasta. The local style of pasta is called ‘Orecchiette’ – you’ll be an Orecchiette master by the time you’re done. We’ll then head to the coastal port of Otranto, where the castle of Anne Radcliffe’s famous novel was situated. You’ll have the day to explore the local area. In the evening we’ll be heading to a local pizzeria for some real Italian pizza. It’s wine day – finally! We’ll head to a wonderful winery and sample the wines unique to Salento, such as Primitivo and Negroamaro. We’ll then head to the seaside for lunch – hopefully still sober. Then we’ll enjoy a guided tour of Lecce, the baroque city known as the Florence of the South. You’ll have the day to enjoy the city then it’ll be time for some fine dining in a local restaurant. After dinner we’ll head to some gay-friendly bars for a drink or two. We’ll head to the famous port town of Gallipoli. You’ll love the little alleyways and stunning seafood. In the evening we’ll have a goodbye dinner at the villa along with some locals. If you’re up for it we can then head back to Gallipoli and party at the local gay bars. It’s our final day so we will say ‘Ciao Italia’. We can give you a lift back to the airport or the train station. You can put those new recipes to good use and rustle up a storm in your kitchen.